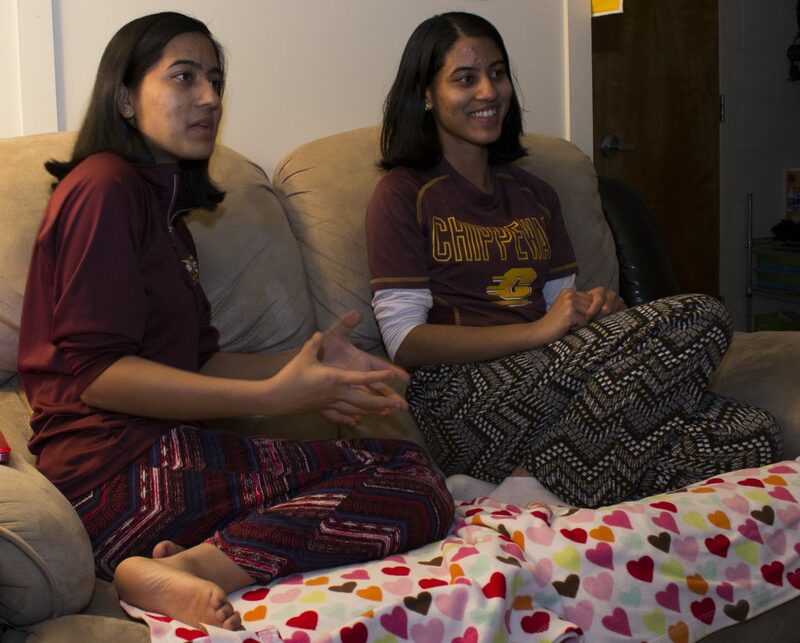 Twinning in College: Suruchi and Sunetti Dash | Grand Central Magazine | Your Campus. Your Story. (Above) Suruchi (left) and Sunetti (right) explain their life goals and how they look forward to possibly working medicine in the army. One of the most memorable memories of Suruchi and Sunetti Dash’s high school senior year was receiving letters from the Central Michigan University Honor’s Program. Before nervously opening the letters, they agreed that no matter what was decided, they would support one another each other and not hold each other back. Both girls were surprised and elated to be awarded the Centralis Scholar Award, granting them admission into the Honor’s Program with a full ride scholarship. Even more unique? Sunetti and Suruchi are twins and each other’s best allies throughout life. Sunetti is double majoring in biomedical sciences and biochemistry with a minor anthropology. She is passionate about the medical field, especially the study of medical anthropology and trauma medicine.The study of medical anthropology fascinates Sunetti because it helps medical professionals understand their patient’s needs better and leads to more sensitive interactions. On campus, Sunetti participates in Circle K, Phi Delta Epsilon and is a guide for Leadership Safari. Recently, she has just started assisting a professor with research in the CMed building. Her favorite part of campus so far has been the willingness of many professors to help. “I can sit down and have a conversation with them about what I’m going to be doing, my fears about applying to med school, and they will sit down and just be helpful” Sunetti said. Suruchi is double majoring in biomedical sciences and biochemistry with a minor in history. Suruchi’s love of history began in the AP US History class that she and Sunetti took their sophomore year of high school. Suruchi cites their teacher, Mr. Tempio, as the most influential teacher to her in high school. Not only did he make the class fascinating and taught Suruchi the importance of history, but he also became a mentor that helped her grow as a student and person. “He’s honestly the reason why I’m a history minor. He taught me that history is fun and it is important and useful to everyday life,” Suruchi said. Suruchi is involved in Circle K, Phi Delta Epsilon and is a guide for Leadership Safari. She also researches at the CMED building with Dr. Rossignal. Sunetti and Suruchi are currently sophomores and are rooming together in Larzelere Hall. While they did not share a room in their hometown of Macomb, Michigan, they chose to room together, knowing that they are living compatible. However, this has resulted occasionally in incorrect perceptions of the twins. “We like the fact people respect us being twins, but sometimes it gets annoying when they assume we want to be together always,” Suruchi said. Sunetti added to the topic. It is important to see Sunetti and Suruchi as unique individuals and not always a matching pair. The best part of being a twin, Sunetti and Suruchi agree, is the strong emotional bond they share. “The best feeling is knowing you have someone to fall back on. When the rest of the world turns their back on you, she would still be the one to be with me. We were born together and we will grow up together,” Suruchi said. Separator image Posted in College Living, Student Lifestyle, Students and tagged with Alison Veresh, honor's college, Student Lifestyle, Xavier Mendoza.